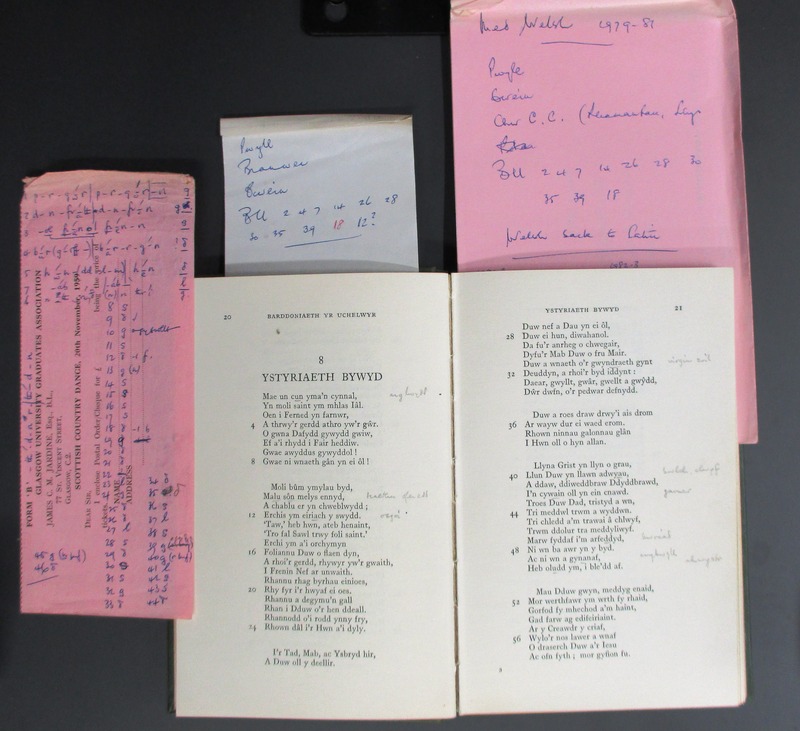 In April 2014 I was approached by Shu-Ching Naughton, the widow of Dr James (‘Jim’) Naughton and offered his private library of Gaelic books for the Taylor and Jesus College collections. I remember Jim Naughton from the 1980s when he would sometimes attend the Oxford Celtic Seminar at Jesus. A lovely man who had a keen interest in Scottish Gaelic (and many other things of course!). He was the University Lecturer in Czech and Slovak and Fellow of St Edmund Hall, Oxford. Dr Naughton wrote grammars of the Czech and Slovak languages, and earned a fine reputation for his translations, for example the short stories of Bohumil Hrabal. He was also a good friend to libraries. It is a privilege to be able to house those books which we didn’t have and to pass on any duplicates to Jesus College and scholars and students (at Shu-Ching’s request). ”It is what Jim would have wanted”, she said, a characteristically generous gesture. 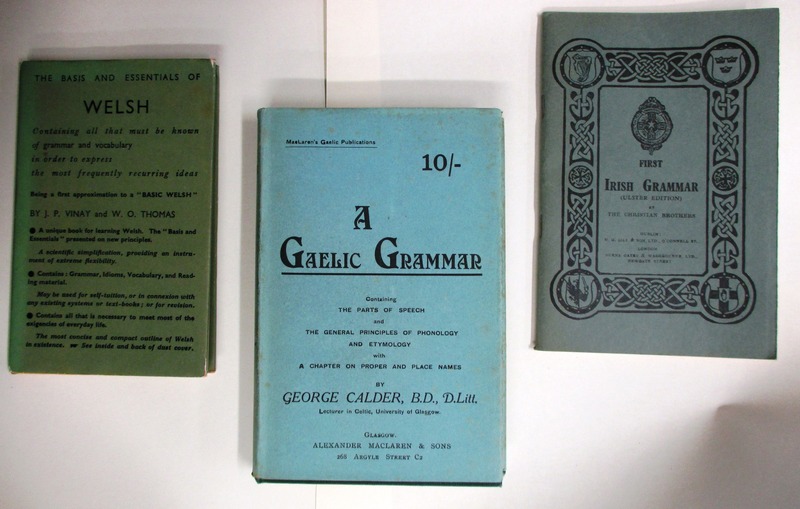 A selection of Scottish Gaelic books from Jim Naughton’s collection. 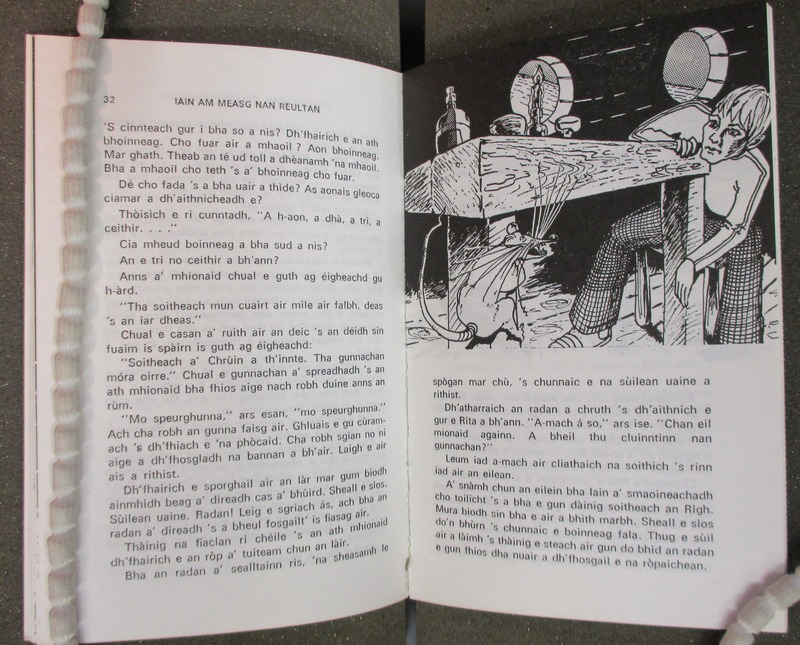 The books we received range in subject matter from Scottish Gaelic poetry and songs to grammars and various periodicals and so have enriched the Taylor’s already strong holdings in Scottish Gaelic, filling in gaps and replacing missing items. It is thrilling that not only has the collection been enriched by the subject matter but that part of the character of the donor is also present. Notes scribbled in the margins of the text, memos, and notes to self all bear witness to the scholar’s fascination with the language and appreciation of the poetry. Another substantial donation has come to Oxford in the shape of the personal library of Robert Leith Thomson 1924-2006, former reader in Celtic at the University of Leeds. 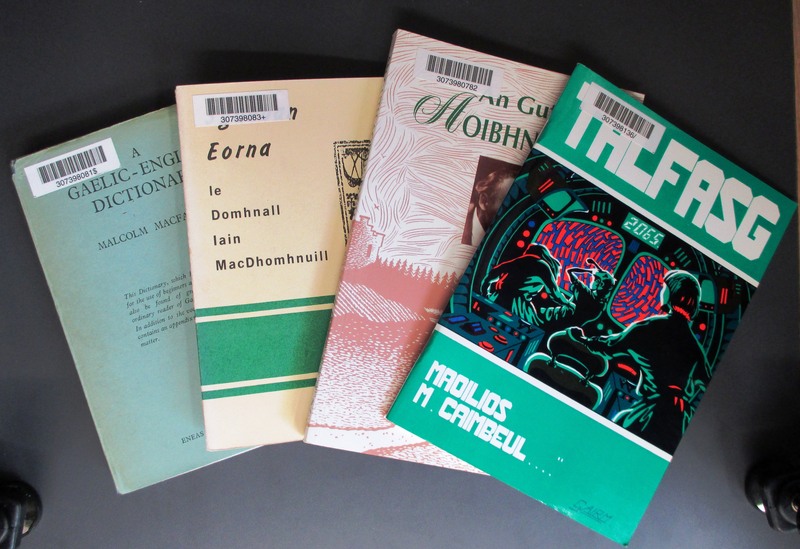 This collection ranges across Welsh, Cornish, Irish and Scottish Gaelic and will add a rich seam of material to the library’s holdings. Books which the Taylor already holds have found a home in the excellent Celtic library at Jesus College. 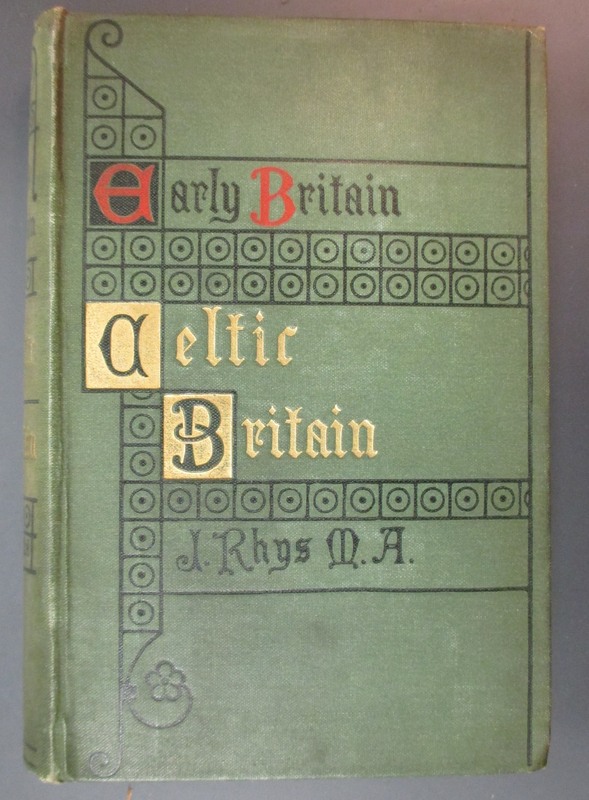 Cover of J. Rhys, Celtic Britain (London : SPCK, 1908). A selection of grammar books in Welsh, Scottish Gaelic and Irish. 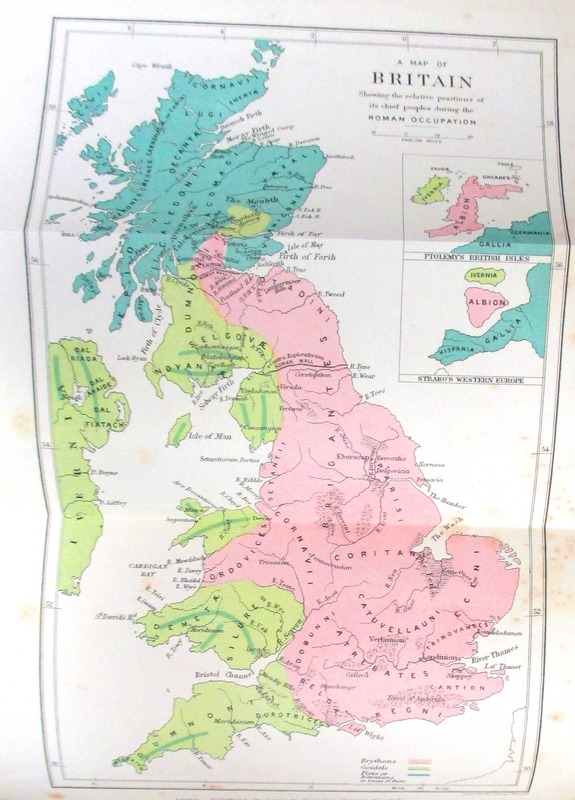 Front matter in J. Rhys, Celtic Britain (London : SPCK, 1908), showing a map of Britain at the time of the Roman occupation. It is a great privilege to look at a personal library and be able to select from it material which one’s own institution does not have. The breadth and knowledge of the scholar struck me – from Cornish biblical plays to Scottish Gaelic writing for children – and also the value he clearly attached to his books. Illustration from Iain am measgnan reultan, a fantasy story in Scottish Gaelic for children by Iaín Mac a’Ghobhainn/Iain Crichton Smith. Parallel text in Cornish and English from Gwryans an bys, the Creation of the world, a Cornish biblical play. All were in good condition, well cared for, with his name in meticulous handwriting neatly inscribed on the front page along with date of purchase. R.L. Thomson’s signature as inscribed in one of his books and the date of purchase. Note the charming use of the Welsh ‘Cyntefin’, meaning the beginning of summer. A large number were purchased in the 1950s, 1960s and 1970s and it is interesting to track the development of the scholar’s interests and to see what helped shape and form his own output. It was great fun to see workings in his own hand in marginal notes, testimony to the fact that this was very much a working library. Scholarly notes and marginalia on a fifteenth-century Welsh poem by Guto’r Glyn from D.J. Bowen (gol. 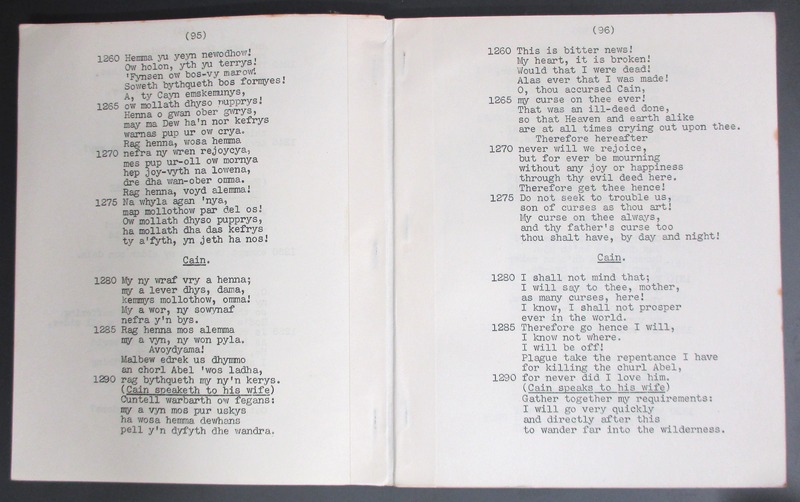 ), Barddoniaeth yr uchelwyr : detholiad (Caerdydd : Gwasg Prifysgol Cymru, 1957). Inserted into some books were newspaper reviews and other cuttings, obituaries of other Celtic scholars thus adding a human dimension to the collection and emphasizing his interest in the community to which he belonged. 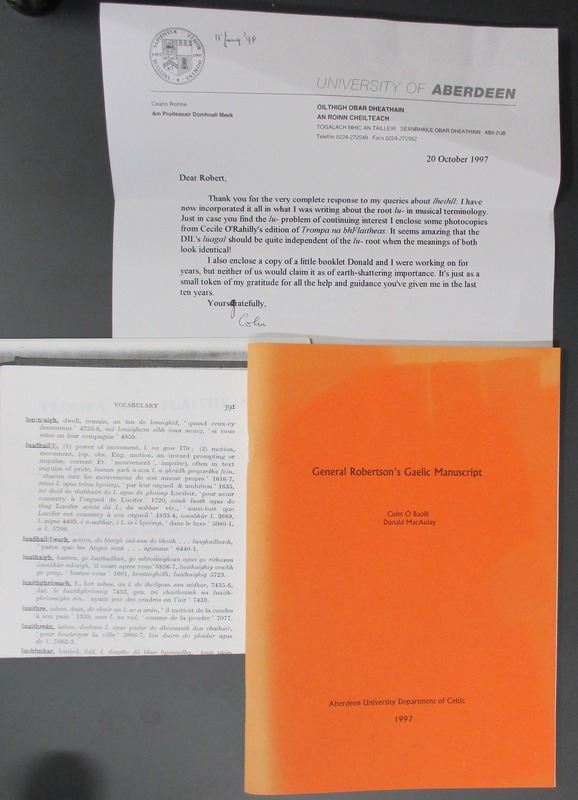 Scholarly correspondence and a thank-you gift in the form of General Robertson’s Gaelic Manuscript, from the author Colm Ó Baoill. 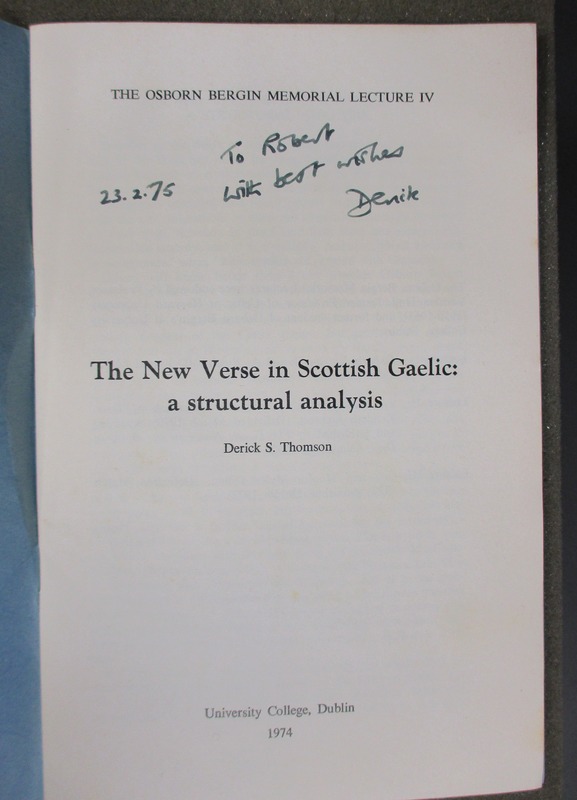 Derick S. Thomson’s ‘The new verse in Scottish Gaelic : a structural analysis (University College, Dublin, 1974), gifted to R.L. Thomson by the author. 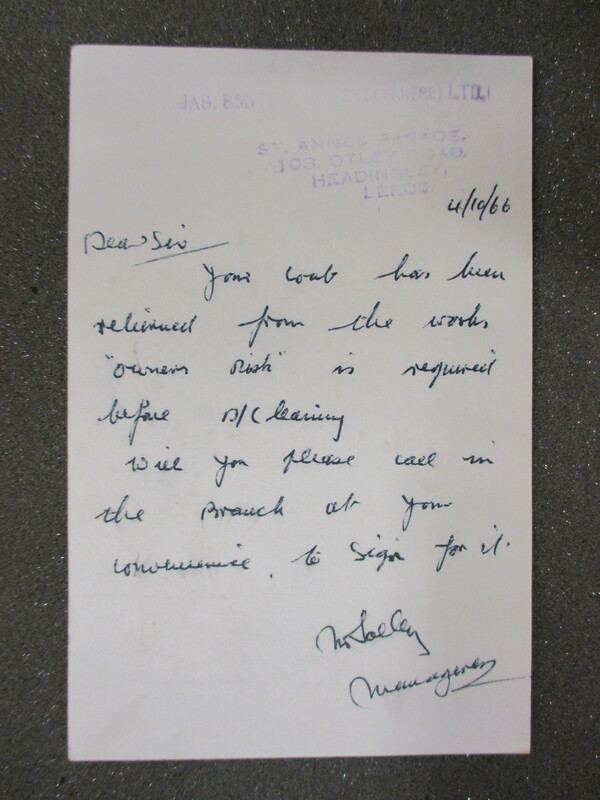 There was even a postcard from the dry-cleaners (dated 1966) informing him his coat was ready for collection! So this was very much a living, breathing collection which nurtured the interests of the owner and gives a snapshot of Celtic scholarship at a particular time. It is especially fitting that some of these books should have their final resting place in Oxford libraries, as it was his time spent as a young scholar at The Queen’s College, Oxford, reading for the Diploma in Comparative Philology and Germanic languages, which confirmed his ‘calling’ to Celtic. R.L. 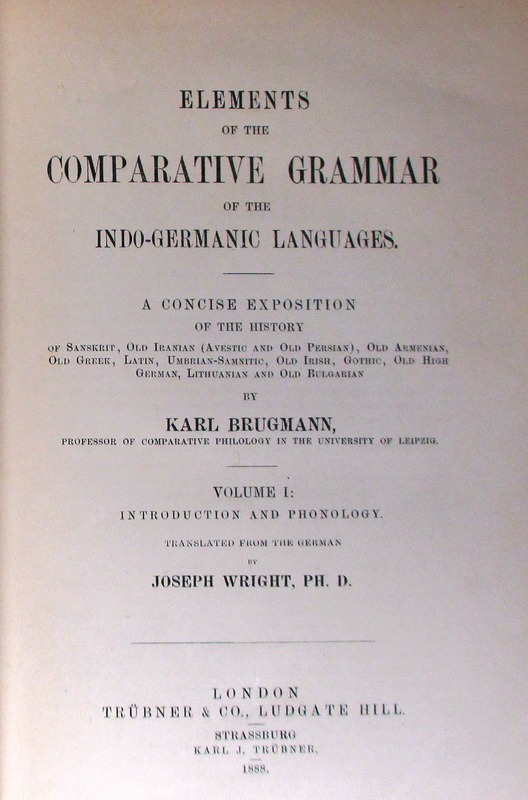 Thomson’s copy of Elements of the comparative grammar of the Indo-Germanic languages which he used whilst a student at the Queen’s College, Oxford. A more mundane aspect of life – a message from the dry-cleaners! Both collections are significant and will add texture to the rich weave of the Taylor’s holdings. 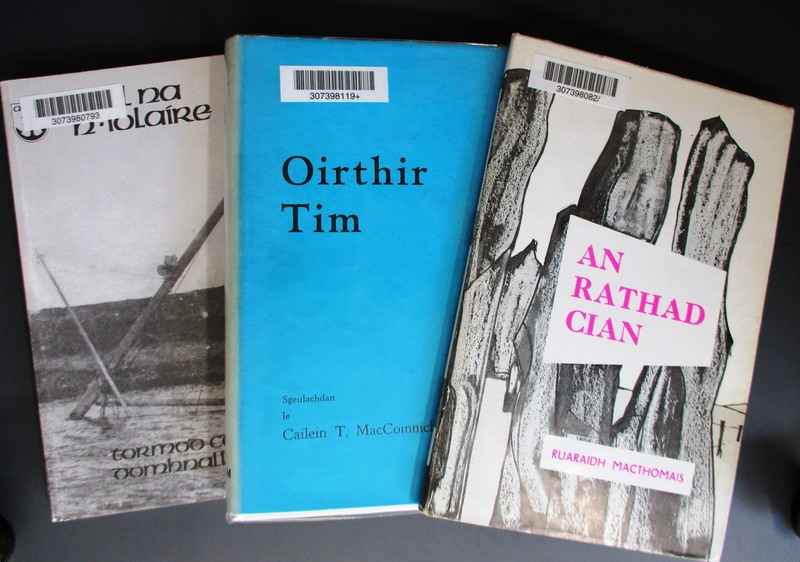 This entry was posted in Special Collections and tagged Celtic, Cornish, Irish, James Naughton, Jesus College, Robert Leith Thomson, Scottish Gaelic, Welsh on 13 February 2015 by Dan Q.